Damp Proof Report & Survey - What Does It Look Like? What Does a Typical Damp Proofing & Tanking Report Contain? There are a number of reasons why people commission companies such as Tapco HomeDry to undertake a damp proofing & tanking report on their property. They may be considering buying a new property or there have been a prolonged period of bad weather and they are concerned it has affected their property. It may be that there are signs of damp or other related issues and the homeowner wants to ensure no problems are hiding somewhere. A damp proofing and tanking report should not take the place of a RICS building survey – these are two very different things. A building survey is designed to look at defects across the whole property whereas a damp proofing survey is designed to look at specific issues concerning damp and defects that can lead to it. The first part of a good report is an overview of the property including the type, condition and age of it. It will often include details such as a thickness of brickwork and the existence of damp proof course. This section of the report will also include external observations of the property. This is where the surveyor will look at elements such as guttering, roof flashing, brick mortar joints and chimneys as well as the ground level, external rendering and visible condition of existing damp proof measures. It will also mention anything that may have restricted our survey such as access problems. The damp proof & tanking report will detail the tests and moisture readings undertaken by the company to find and damp problems in the home. Surface moisture readings are normally taken at exposed ground floor walls in random locations around the home both vertically and horizontally using a calibrated moisture conductivity meter. This records levels of moisture within the walls and from the pattern of these readings, a qualified surveyor will determine the exact cause of the damp problems. Damp from the ground (Rising Damp) will not rise above 1.5 metres so readings above this level indicate a problem of a different nature. These readings will help assess if the property is suffering from rising damp, rain penetration, leaking plumbing or high-humidity. The surveyor will also look at the location of the problem in relation to raised external ground levels, as this can also compromise the DPC. Lateral damp penetrates through walls when groundwater is forced through the wall by hydrostatic pressure. A similar measurement is used to detect this in walls around the home and may lead to a recommendation of some tanking measures to prevent this condition recurring. 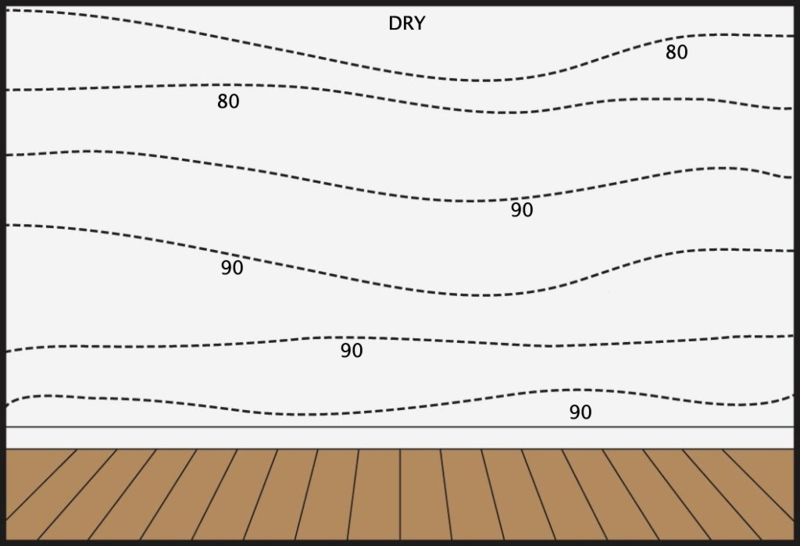 If the moisture readings detect more than 20% moisture content in plaster, then there is the likelihood of a damp related problem. Often this will mean the plaster has been contaminated with salts carried in the water from the ground and this will mean the use of special plaster to cover the walls once the source of water has been dealt with. Again, information will be contained in the report about levels of moisture and what steps are to be taken. Rain leaking into the property can lead to severe damage, so the results of the inspections are documented in detail any defects, such as defective rendering, defective lead flashings and guttering are some of which allow rain into the property. As well as telling you what moisture readings the surveyor obtained and what this means, a good damp proof survey will detail what steps are required to stop them. Removing skirting timbers, architraves and wall plaster. Similarly, details will be given about the damp-proof course and steps required to ensure this is fit for purpose. Often this might involve renewing the course with special ‘cream’ injections of a special new type of damp proof course that works in most types of buildings. If there are signs of rain penetration, then the report will detail where these are and what steps need to be taken to stop the condition and repair the damage. A comprehensive damp proof survey will contain a lot of information that helps you have a good understanding of your property. It will not only detail what is wrong with your property but put all of this information into context to help you understand what work is required and why this is so important. There will be a floor plan in the report of the property as well as an itemised list of the work required and an itemised list of the costs involved. This helps the homeowner see where the problems are and understand exactly what the costs involved in dealing with the problem will be. It is always very advisable to instruct a reputable company to survey a property, prior to exchange of the purchase. The report will also give you information about the next step if you decide to use the company to carry out the work recommended in the report. Obviously, it is entirely up to the homeowner if they choose to take action on the report’s recommendations but the vast majority of people do because the effects of damp conditions can be serious – damaging to both the structure of your home and even the health of people within it.